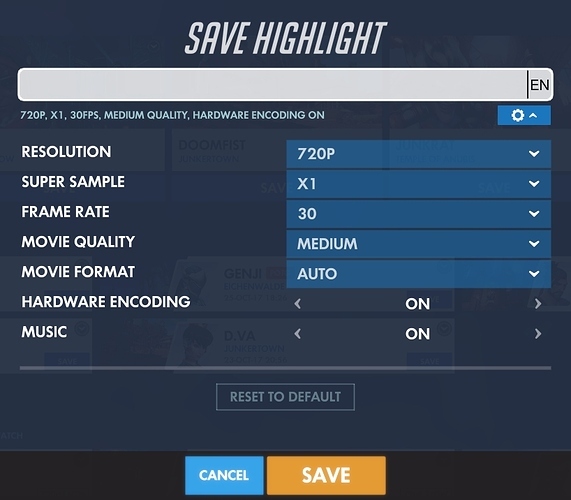 I can’t export video highlight clips from Overwatch. Attempting to export videos results in Saving Error. Using DXVK 0.94, on Linux Mint 19 (Cinnamon) 64-bit. My only workaround is to just record it with OBS as its being played back in the game while running in Windowed mode. It doesn’t seem to get recorded when in Full Screen mode in OBS, since it’s just black screen, probably because it’s using Hardware Acceleration to draw in full-screen. Those fixes only apply to Windows, and do not work on Lutris. I still haven’t been able to find a fix for this issue since. I’ve updated Lutris and changed DXVK version since I posted this, but nothing changes, and still can’t export videos. WEBM? huh thats unfortunate… I hope a fix comes for MP4. Click the gear icon and change the movie format. Thanks! I missed that setting.